This is a modern, glamorous spin on the 1970s favourite, cheese and pineapple. Warm a frying pan over a high heat and dry-fry the chorizo slices for 2 minutes in a frying pan, until sizzling. You may need to do this in 2–3 batches, depending on the size of the pan. Drain the slices on kitchen paper and then leave to cool. 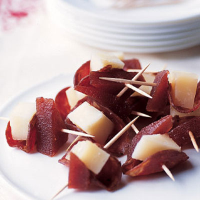 Fold the slices into quarters and thread on to cocktail sticks with the Manchego cubes and Quince Paste. Arrange on a plate and chill in the fridge until ready to serve.